Okay I admit my omelette is Not Good. I kid myself it would be better if I had an omelette pan. Anyway here goes. 1. Gently cook zucchini, spinach and broccoli in a small amount of water until tender. 2. Gently whisk 3 eggs together and pour over vegetable mix. 3. Pull the eggs in from the side of the pan with a plastic spatula or egg slice. Keep doing this until the eggs are nearly all cooked through. 4. Using a spatula turn one side of the omelette over on top of the other side. 5. Gently slide out of the pan onto a plate. Season with salt and pepper and serve. 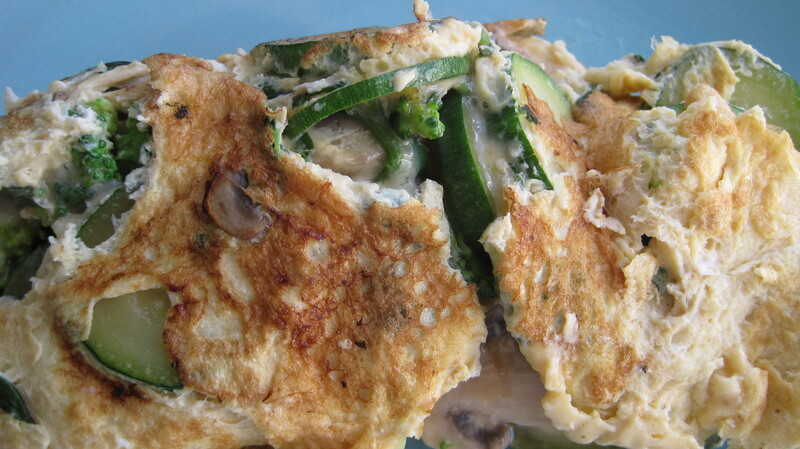 Variations: Add some grated cheese to the middle of the omelette if you have it.